As you approach the site you will see a kiosk where you can pay the entrance fee and take a pamphlet, which will guide you through the site. Masada was originally built as a desert fortress by the Hasmonean Kings and expanded substantially by King Herod, who placed his family there for safe-keeping in times of danger. When the Great Revolt broke out in 66 CE, a large group of Sacarii families overtook the mountain and made it their home. In 70 CE, when the Second Temple of Jerusalem was destroyed, the group’s fighter joined the families already at Masada and, only two years later, the Roman Tenth Legion finally laid siege to the last Jewish stronghold against Rome. 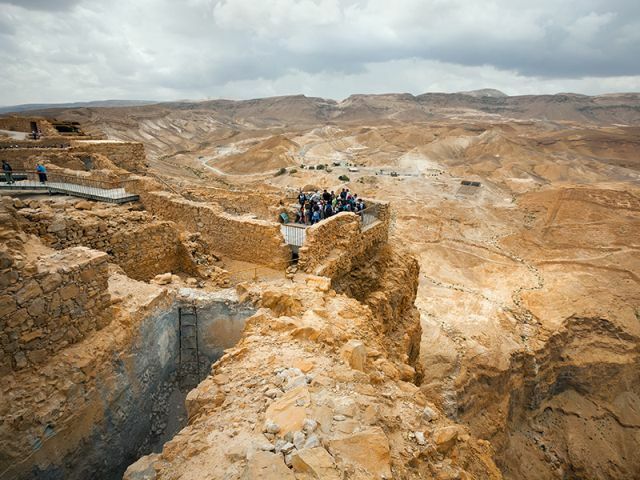 The story of the destruction of Masada in 73 CE, and the incredible choices made by the people who lived there (under their leader Eliezer Ben Yair will unfold as you tour the area, visiting the impressive remains that have been partially reconstructed. 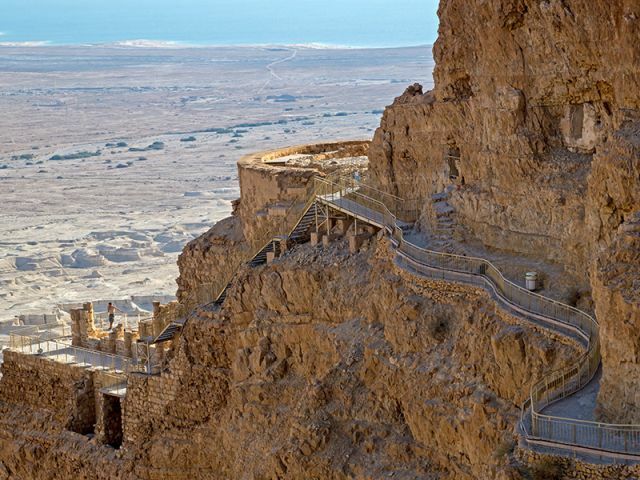 You can climb Masada from the western side, via the Roman Ramp. At the foot of the mountain on the eastern side there is an large visitors’ center with a store (there you can buy Dead Sea products), a museum and places to eat and drink. You can access this center for free, using the snake path, or by taking the cable car (for which there is a fee). Tickets for the this can be purchased at the kiosk near the ‘Snake Path Gate.’ In order to return to the western side, you need to ascend the mountain and descend via Roman Ramp. Masada is an ancient fortress, situated on top of an isolated rock platea. Aakin to a mesa, it faces the eastern edge of the Judaean Desert, overlooking the Dead Sea 20 kilometers (12 mi) east of Arad.